If you're like most people with a Squarespace website, you've probably thought about marketing automation, but it's never really been a priority. Honestly, I don't blame you. For starters, when you think of marketing automation, you usually think of enterprise tools like Marketo, Eloqua or maybe even Hubspot. Those tools are often made for big businesses, which isn't exactly the target Squarespace demographic (i.e., more DIY and small business). More practically though, Squarespace doesn't really offer any integrations with a marketing automation platform. Their contact forms go to MailChimp or Google Sheets, so you're stuck with that if you're not accustomed to pasting and styling forms all day–which is probably one of the reasons you picked Squarespace in the first place. But on the other hand, marketing automation with Squarespace is actually not all that complicated and–I joke you not–free if you know what tool to use. First, Why Do Squarespace Folks Need Marketing Automation? We live in a day where we work so hard to get someone to our website and then even harder still to get them to fill out a form or engage with us in any meaningful way. More than 30% of entrepreneurs and small businesses either have a manual system or no system at all for managing the contacts and leads that they generated on their websites. Another 30% are simply using their email inbox. We end up having no clue of what's happening with our customers and no sense of where the opportunities lie. That's why you need marketing automation. You can tag and track things your subscribers and customers do automatically and then trigger time-saving and money-making campaigns without ever having to get involved. If you're doing any sort of promotion of your Squarespace website, you really can't afford to neglect the marketing automation opportunities to help you maximize the return on what happens after that first visit. Especially if you can get started for free. Next, What's This Free and Easy (and Free) Automation Tool You Speak Of? Ok, enough with the suspense. Drip is the powerful and easy-to-use marketing automation platform we've been alluding to. Drip is free to start with and offers affordable plans beyond 100 email subscribers in your account. I'm going to go out on a limb here and guess that you picked Squarespace because you wanted an easy way to quickly publish a beautiful website that didn't look like everyone else's and didn't cost and arm and a leg. If you had unlimited budget and time, you would have hired a developer and a designer and built something custom. But instead you decided to pick a platform that had a ton of web-publishing features crafted to be easy enough for you to use and designed to grow your business–or whatever goal is at the core of your online endeavor. That's the same idea behind Drip, but only with marketing automation. You get a full suite of the most powerful marketing automation tools on the market today, but they'e been designed so intuitively that you don't have to be an automation expert to use them. With Drip, you get email marketing features just like you'd get with a tool like MailChimp (see our full review between Drip and MailChimp here). Drip lets you create and send just about any message you'd dream up to your subscribers. But email is just one of many components of a marketing automation platform. The most compelling feature of most automation tools, however, is the mechanism by which automation sequences/campaigns are built. Workflows are where automation strategies are built in Drip, and they are a thing of wonder to play around with. You start with a blank canvas or a template and then build out your marketing campaigns according to your business rules using their building-block like actions. If you can logically break down the steps in your marketing process, you can build it in Drip. Drip workflows let you create dynamic marketing campaigns that can do just about anything. Automation tools like Drip give you the ability to manage your entire subscriber list and customer base given their solid contact management tools. You can apply tags, trigger events, set custom fields, and so much more. Finally, you can get out of Gmail, or your Excel spreadsheet or who knows what you're trying to cobble together to get a sense for all the things you know and have done with a customer. 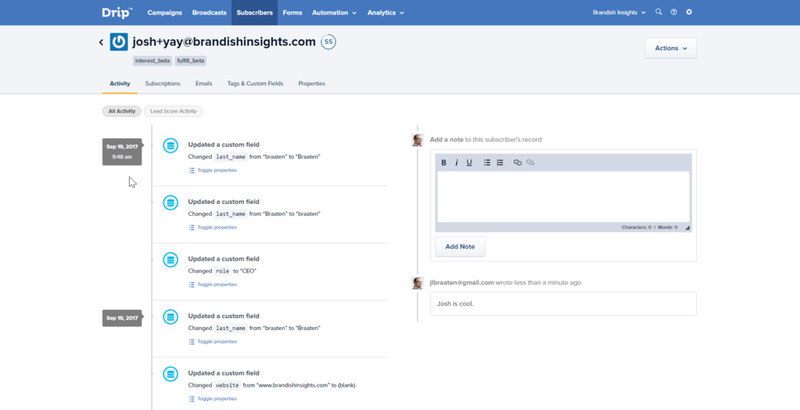 Drip's contact management features will make you feel like you've got a world-class CRM. The entire subscriber journey is tracked and available for you to view in an easy-to-interpret customer timeline. Do you love Drip yet? It gets better. Best of all, Drip is free up to 100 contacts (and starts at $41/month after that), which makes it the perfect platform for those that don't want to have to pay for a new tool while they're learning it and don't want to break the bank once they're off and running. Let's show you ten super simple ways to start incorporating marketing automation with your Squarespace site using Drip. Now we're going to jump into some marketing automation strategies that you can put to work on your Squarespace website using the Drip platform. While the opportunities are limitless, we've assembled these common use cases that many entrepreneurs and marketers tend to struggle with. Keep in mind: any marketing tool you use should be able to do these things; we just happen to like Drip a lot. In order to automate the marketing your subscribers receive, first you need subscribers. And the easiest way to get people to subscribe on your website is to use an email capture pop-up form. Surely you've seen them across the web. Some pop-up forms take over the whole page. Those are annoying. Other forms follow you everywhere as you scroll on the page . Also... annoying. Drip's pop-up forms are super subtle and tasteful, which can help contribute to an surprisingly decent lead flow in the long run. 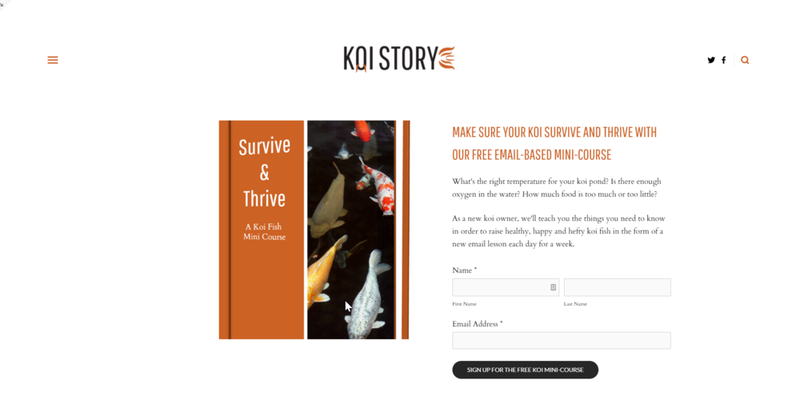 For example, I've generated close to 1,000 leads in the past year since installing a Drip pop-up form on my koi fish blog last November. A mini-course consisting of 3-5 emails sent in a sequence is an excellent piece of lead-generation content. The forms you put on your website typically kick off some sort of a process. Someone fills out the form and then you have to do something, right? With Drip, the "something" can all be automated. Instead of you getting an email and then having to do something with it, Drip can handle that for you. Instead of you having to reach out to the customer to schedule an appointment, Drip can do it. Need to qualify a lead? Let Drip handle that for you. Want to automatically send a newsletter each week based on your newest blog posts? Once again, Drip has got your back. And while Squarespace doesn't integrate with Drip directly, we put together an easy work-around that lets you connect Squarespace and Drip like peanut butter and jelly between two pieces of bread. If you're doing any lead generation, then you're probably giving away a whitepaper, guide, e-book, or other type of lead magnet in exchange for the email address–among other things–of the people visiting your landing page. Hooking up an automation platform like Drip to Squarespace will almost always be your preferred way to deliver digital goods/services. Whether you want to simply send a link to a .pdf or put into motion an entire automation campaign, you have infinitely more options available to you with Drip than with a simple email marketing tool. For example, we use the technique mentioned above to route new contacts into Drip where we then kick off a week-long automation campaign that sends them a new chapter in a course each day for seven days. Drip can help fulfill any number of digital goods & services you offer on your website. Another super-handy Drip feature is the RSS-to-Email option, which bloggers tend to love. With this feature, you supply the URL for your blog's RSS feed and specify the cadence for when blog updates go out and Drip will automatically send your blog's update/newsletter for you. If you're like most people, you don't have unlimited time to spend each week on marketing, so removing one-off tasks like this from your plate can really start to free you up to focus on newer and bigger marketing opportunities. Not only is this a cool marketing automation feature, but it's one that's not entirely that common. Drip makes a lot of smart choices like that about what features to include and which ones to exclude because they add clutter or needless customization when none is really needed to get the job done. With some simple configuration and a few dynamic values, you'll never have to manually send out blog updates again. Most of the big e-commerce stories use a common tactic called a cart abandonment campaign when a potential customer adds an item to their shopping cart but never then doesn't purchase that item within a given time. An email containing a coupon or other special offer is sent to the customer to entice them to complete their purchase. Depending on your online shopping habits, you may have one or more of these in your inbox right now. It's a highly effective tactic that enterprise companies use every day to add another 5-15% of revenue on top of existing daily sales if done right. And with Drip and Squarespace, you too can create cart abandonment emails campaigns, no matter what you sell. If you had a Squarespace fruit store, Drip could send banana coupons to people who added bananas to their shopping cart but didn't buy. A new subscriber campaign is an email or set of emails that you send to people who recently signed up or downloaded something from you. Once again, Drip makes it easy to create this campaign once and then have it automatically trigger each time a new email/lead hits your list. Here's a simple workflow that checks to see whether new customers and contacts are "indoctrinated" and sends them a campaign if they're new to your brand. Drip workflows are easily shareable from one account to another. Contact me if you want a free copy of any workflow you see here. Webinars are probably the single most effective tactic for anyone selling things on the Internet because it combines the benefits of in-person sales with the convenience of purchasing something online. Yet sadly, few marketers and entrepreneurs have ever hosted a webinar for one reason or another. Sometimes, it's because we think we don't yet have an audience big enough to host a webinar. In reality, the right topic presented at the right time of day to the right visitors can convert at a rate that's 3-5x higher than standard campaigns, which can make this channel a top-performer when it comes to ROI. Other times though, it's because technology can be hard. But it doesn't have to be. Drip integrates with webinar platforms like Crowdcast, Demio, and our current favorite, BigMarker because they host great webinars. Plus, we can use a Squarespace web page for our webinar registration process and then route registrants automatically to BigMarker, which rocks. It's super convenient to build a webinar sign-up page on Squarespace and then send the data to your email and webinar tools. One of the best things about using a marketing automation platform is the personalization capabilities you have at your fingertips. We already covered a lot of utility-based and behavior-based automation features, but nothing illustrates an automated personalized experience like a happy birthday email. If you know a person's birthday, you can store it as a custom field in Drip and then automate the process of sending them an email, which can be completely personalized based on what else you know about that person. This feature might not seem like it's all that important, and you're right. Birthday emails are a little novel on their own, but they can have a huge impact over time when you combine this tactic with other personalized communications. Ending an email to someone on their birthday is the tip of the proverbial personalization iceberg for Drip. Let's say you're selling something on your Squarespace website that's fulfilled digitally like an ebook, audio file or .pdf, for instance. What this means for you is that you can trigger automated processes and campaigns when people buy something from you. By default, Squarespace allows you to send files when people to purchase, which is nice. But Drip gives you full control to fulfill more complicated purchases while creating a memorable customer journey along the way. That's not just nice. It's awesome. Drip integrates with Stripe just like Squarespace does, which means Drip can deliver any experience purchased on your website. Not everyone sells something directly on their website. Some folks–especially if you're in a service-based business–are more likely to first generate leads and then convert those leads into customers through some sort of a sales process. It's common to use a customer relationship management (CRM) tool to help manage this process. Drip isn't a CRM per se, but it's night-and-day compared to what most entrepreneurs are doing right now and many will find that they'd rather just use Drip to manage their pipeline than adding a CRM, which can often be overkill. This workflow is entirely more complicated than most, but it's really not that hard to follow logically (or build!) after a slight learning curve. So that's it... ten reasons why Squarespace & marketing automation make sense together and how Drip is the tool to make it happen. If you've got general questions, comments or feedback, please do share your thoughts about Drip and/or MailChimp below. Also, readers of this blog are always welcome to contact me with your specific questions around Drip, Squarespace or any of the other marketing tools you're using today. Drip Vs. MailChimp: Which One Will Help Grow Your Business the Most? 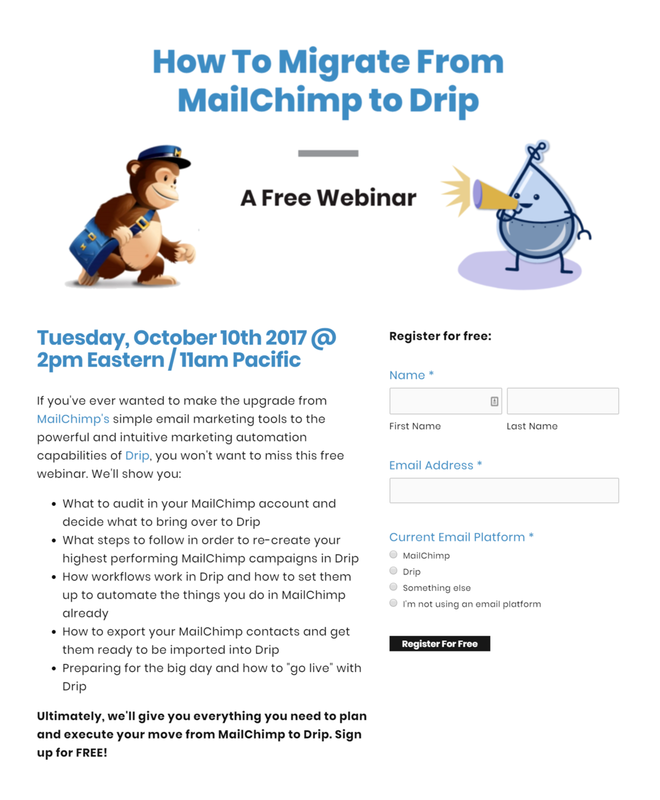 MailChimp is a fantastic email service provider, but can it hold up to the marketing automation capabilities of Drip. Find out in this head-to-head comparison of Drip vs. MailChimp. Do you want to do do more than just simple email marketing with the leads and contacts you gather on your Squarespace website? I don't blame you. In this tutorial, we'll show you how to integrate Squarespace with Drip, the world's easiest and most powerful marketing automation platform. Automate Your Marketing for Free. Before We start, Why Integrate Squarespace with Drip? 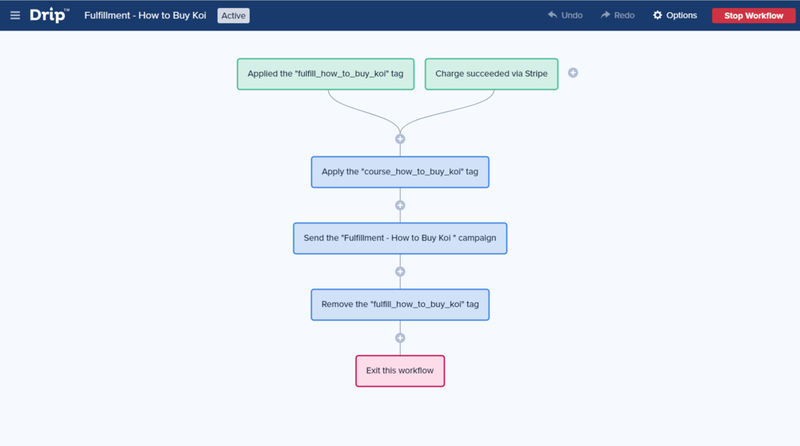 Unpacking that a little more, marketing automation tools like Drip are a great way to automate manual tasks that sap the already limited time we have to dedicate to our marketing. And unlike basic email marketing tools like Mailchimp, which have recently included some piecemeal automation features, Drip is among the class of tools that make all sorts of things easier and faster. At the building block level, you can created completely automated workflows filled with emails, decisions, forks, delays, one-off emails, purchase notifications and more. These features help you save time by completely automating the process of sending campaigns, assisting sales teams, qualifying leads, fulfilling orders, and much, much more. Squarespace doesn't yet integrate with Drip natively, but that shouldn't stop you from being able to experience all of those sweet, sweet automation benefits. Once you've created these accounts, which are all free on top of your existing Squarespace subscription, you can proceed to the next section of our guide, which will walk you through exactly how to integrate Squarespace with Drip. Let's get started on saving you time and making you more money! Our method for integrating Squarespace and Drip involves Google Sheets. Find the form in Squarespace that you want to send to Drip. Next, navigate to the Storage tab within the Edit Form interface. Enter the name of the Google Sheet you want to send new form submissions to. Squarespace will automatically create a new Google Sheet if you enter a name of a document that doesn't yet exist. The name of the Google Sheet document we're looking for is: Contact Big Picture Web. Save your changes and you're done with step one. Easy, right? The next step involves getting new contacts/leads/entries in your Google Sheet over to Drip. In order to do this, we're going to enlist one of the most helpful tools on the entire planet for marketers, Zapier. Imagine you have data or information about a person in one tool (e.g., Google Sheets) and you wanted to send that information to another tool (e.g., Drip). Zapier is like a switchboard operator for your different marketing tools. In this next step. You'll see how to get information from that Google Sheet into Zapier. Assuming you've created a Google Sheet and a Zapier account, head to the Zapier directory and search for both Google Sheets and Drip. Search for Google Sheets and Drip in the Zapier Explore directory. Look for the Zap—this is what Zapier calls an automation rule—called "Create or update Drip subscriber from new row in Google Sheets". Once you've found it, click on "Use this Zap." Follow the simple steps in the wizard to connect to a Google Account and select the sheet you want to sync with Squarespace. You've just completed the second step of our tutorial. High five! The last step of our simple little process is to complete our Zapier rule setup to connect it with your Drip account. 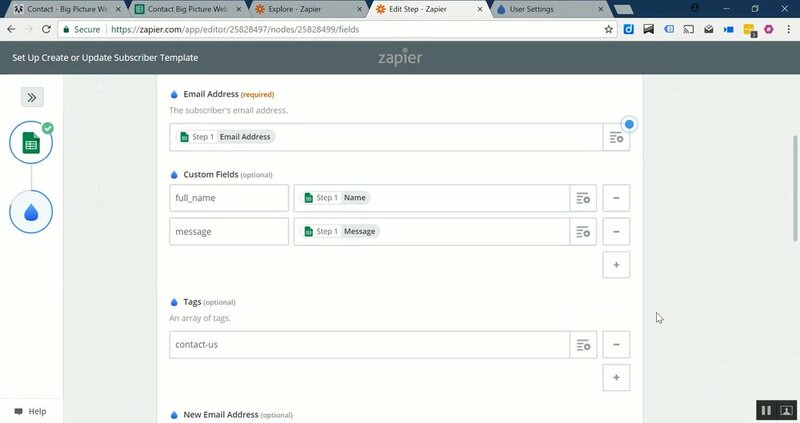 Follow the prompts from Zapier to go through the different authentication requests to connect your Drip/Squarespace/Zapier accounts together. If you get stuck at any point, refer to the video above. There are a lot of clicks, but they're easy clicks, so we should be OK.
At some point, you'll be faced with this screen, which will ask you how you want to map fields from your Squarespace form into Drip. Mapping an Email Address is required. Select the appropriate field from your Google Sheet to designate the field for the Drip Email Address field. Select the advanced options link to set addition custom fields in Drip. Take note of the conventions suggested in the video above. Tag new submissions of a Squarespace form uniquely. For example, we're tagging people with a contact-us tag when the form is filled out on our Contact page. Once you've gone through the wizard on the Zapier website, you'll get a confirmation that your Zap is active and that all your new form submissions on your Squarespace website are headed to Drip. Excellent! Except, let's test it out to make sure it works. Once you've completed all of these steps, you should be able to test things out by sending a test submission through your Squarespace form. Wait about five minutes—the minimum time between you Zapier Zap—and then check to see that the subscriber has been added to Drip. Validate that your new Zap is working by examining your new contacts in Drip. If everything looks like you'd expect, then you're all set. Drip and Squarespace are now tied at the hip, affording you untold marketing automation capabilities above-and-beyond what you can do with the default form capture options Squarespace offers. Squarespace and Drip are Integrated. Now What? Once you've integrated Squarespace and Drip, the next step is to automate all the different parts of your marketing using Drip's marketing automation capabilities. We'll be posting a lot more in the future about what are the highest revenue opportunities in marketing automation and how you can experience them as a Squarespace website owner. In the meantime, let us know in the comments or in social media whether this tutorial was helpful and if it's something you end up using to make more money online. The Squarespace customer service team won two Steve Awards last week. Also known as the American Business Awards, these bad boys are coveted as some of the nation's top awards for businesses. Squarespace's 50-person-strong Customer Care Team won the Gold Stevie Award for Customer Service Department of the Year - Computer Services, while their Director of Customer Care, Christa Collins, received the Bronze Stevie Award for Customer Service Executive of the Year. The Squarespace Help Center - The most commonly asked questions are answered in full text and image articles, and they even have a Squarespace 101 section for new customers. Squarespace Help Tickets - Squarespace's signature form of customer service is its blazing-fast email ticketing system, which handles close to 15k requests each week. Submit a ticket from almost anywhere on your site and get an answer often within minutes. Squarespace Answers - This community managed forum features questions and answers from Squarespace customers and designer/developers that use the platform. If your questions are a bit more in-depth, give Squarespace Answers a try. Live Chat - Last but not least, you can live chat with Squarespace's Customer Care team Monday-Friday between the hours of 11:00 a.m. and 7:00 Eastern time by clicking on the chat invite prompt that appears on the Help Center when chat is available. I was shocked to hear that Squarespace supports over 14,000 tickets per week with their awesome Customer Care team. When it comes to customer service, Squarespace, has definitely exceeded my expectations in the few times I've needed to engage them as a Squarespace customer. Congrats, Squarespace, on your Stevie Awards - you deserve them! Web publishing platform Squarespace is an international hit, both in terms of its customer base and more recently its business operations. Squarespace's Dublin offices were announced in early May, marking the first office outside of the U.S. for the start-up content management system. While Squarespace offices in Ireland is news, international customers is nothing new. Squarespace has been popular in the U.K., U.S., Canada, and Australia for years. What countries will Squarespace expand to next?